ABUJA-PRESIDENT Muhammadu Buhari, Monday, declared his intention to seek re-election in the 2019 presidential election. The President also enthused that victory was sure for the All ruling All Progressives Congress, APC, party in the next year’s elections even as he called all the party members to be united before the elections. Already, President Buhari has asked members of APC to give waiver to members of the National Working Committee, NWC, and state executive members that intend to contest in the party’s congresses. The President declared his intention to seek re-election at the closed-door meeting of the National Executive Council, NEC, meeting at the national Secretariat of the APC in Abuja. He said he was responding to the clamour by Nigerians to re-contest in 2019, adding that he wanted to give NEC the honour of notifying them first. Earlier in his speech on the report submitted by the APC National Executive Technical Committee, President Buhari told the APC faithful that the party would cruise to victory in the forthcoming elections. He further explained that his insistence that there should be Congress for the party contrary to the tenure elongation by the NEC to NWC members was to avoid unnecessary litigations especially as some members of the party had already gone to court to oppose the elongation idea. He said going by the Constitution of the party, members of the NWC that intend to contest in the Congress should resign thirty days before the Congress, stressing that it would be difficult for any of them to qualify to seek re-election. Consequently, he sought the approval of the party for the waiver for members of NWC to qualify them to contest. He expressed delight that the meeting was holding to thrash contentious issues and specifically thank members of the Technical Committee for a job well done within the limited time frame. He said, “It shows a great sense of commitment to the ideals of our party with a view to consolidating and positioning the party to continue delivering good governance in the overall interest of Nigerians. “With the present state of the party and based on the report submitted by the Technical Committee, It is important to focus on how to move the party forward by avoiding actions detrimental to the interest of the party. “Considering that politics is a game of numbers, we must not be a house divided against itself and must try to note, appreciate and accommodate our differences as far as the law permits. “Upon my review of the Report, my position is to ensure that the party tows the path of unity, legality and cohesion and not that of division. “Therefore, I am stressing that we should strengthen our internal democracy by organising the Party’s Congresses and Convention where election of National Executive Committee members would be held. “This will automatically end the cases filed by members seeking orders of Court compelling the party to hold its Congresses. “I also believe that the current executives should be free to vie for elective positions in the party if they so wish as permitted by our Party constitution. “However, considering the provision of Article 31(1)(iii) of the APC Constitution which requires any serving officer desirous of seeking re-election to resign from office 30 days before election, I am not sure of the practicality of present serving officers’ ability to meet this condition. “Necessary waiver(s) should also be extended to executives at the Ward level whose tenures may have elapsed, and indeed to anyone knocking at our doors from other political parties. This is in the spirit of the Right to Freedom of Association guaranteed by the 1999 Constitution of the Federal Republic of Nigeria (as amended). “In this circumstance, the party should officially issue a statement on the above Waivers so that our house may be full. We all must not be ignorant of the times, and the journey that is ahead of us. “Just like our party symbol; “the Broom,” which typifies strength in unity, let us strive to remain united in our purpose. Victory is sure by the Grace of God, and together we must continue to sanitize Nigeria’s political environment. 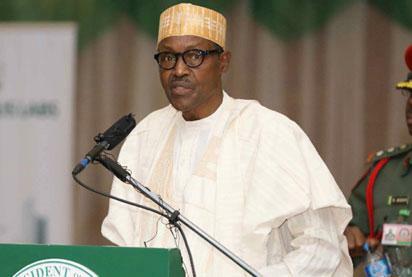 The post I’ve decided to contest in 2019-Buhari appeared first on Vanguard News.